Minnie Mouse is a classic character that has been around for decades. She's more than just Mickey's Girlfriend. She's a strong female that's independent and ready to take on any challenge. There's so many party favors and party supplies available for Minnie Mouse that no matter what you want to accomplish, we can make this dream come true. There is never a dull moment with this mouse! The Minnie Mouse Party is the perfect theme for your daughter's next birthday! Designed in pink and green colors, the Minnie Mouse theme is a lively theme that will add tons of fun to any birthday. Disney Minnie Mouse Dream Party Birthday 9" Square Lunch Plates, 8ct. Disney Minnie Mouse Dream Party Birthday 7" Square Dessert Plates, 8ct. Disney Minnie Mouse Dream Party Birthday 9oz. Paper Cups, 8ct. Disney Minnie Mouse Dream Party Birthday Lunch Napkins, 16ct. 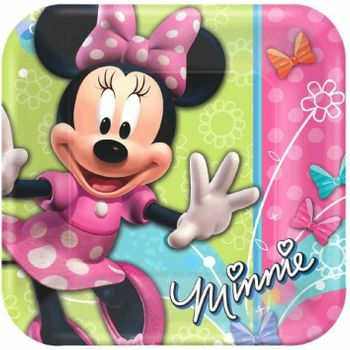 Disney Minnie Mouse Dream Party Birthday Plastic Table Cover, 1ct. Disney Minnie Mouse Dream Party Birthday Plastic Treat Bags, 8ct. Disney Minnie Mouse Dream Party Headband Party Ears, 4ct. Disney Minnie Mouse Dream Party Birthday Activity Kit, 4ct. Disney Minnie Mouse Dream Party Mini Mirrors, 4ct. Disney Minnie Mouse Dream Party Birthday Heart Hair Clips, 8ct. Minnie Mouse Dream Party Birthday Invitations, 8ct.